If you spot someone snacking on green eggs with a little pork on the side, don't be alarmed: They're probably celebrating Dr. Seuss' birthday, which is today, March 2. 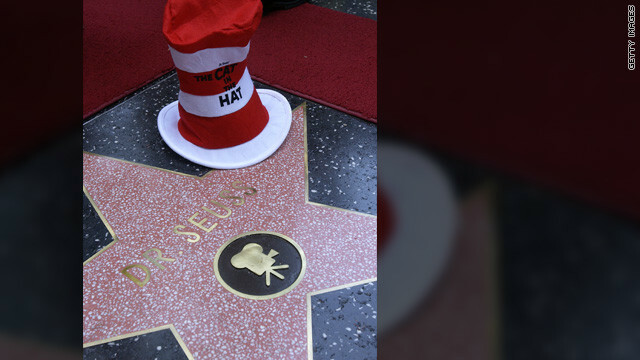 Aside from cooking up a meal based on his infamous title, there are other ways to honor the man who gave us such enduring stories like "The Cat in the Hat" and "Oh, The Places You'll Go!" For starters, you could read: March 2 is also the National Education Association's "Read Across America Day,". Events are happening across the country, and Zac Efron and Danny DeVito, two stars of the adaptation of "The Lorax," also took part in the reading fest with an appearance at the main branch of the New York Public Library. And secondly, you could check out the film "The Lorax" based on the Seuss book of the same name. Also starring Taylor Swift, Betty White and Ed Helms, "The Lorax" arrives in theaters today (although the reviews on Rotten Tomatoes aren't looking kind). Over at Time magazine, they're taking a look at Seuss apart from the classic series of books we know so well, exploring his cartoon work, humor writing and efforts in advertising. But perhaps the best thing you can do is follow Seuss' example: The still famous author reportedly had to try 27 times before he got his first book published - try, try again, indeed. Seuss, who was born Theodor Seuss Geisel, would've turned 108 today. He died in 1991 at the age of 87. It's really a great and helpful piece of information. I'm glad that you just shared this helpful info with us. Please stay us up to date like this. Thanks for sharing. You forget our Dr. Seuss has passed! Would be a very grave mistake. It's Dr. Seuss, stiff in a box! For here lies Seuss, all still and hard. Remember next year what Ive said. I'm pretty sure he'll still be dead. I'm glad he "tried, tried again" & didn't give up after the 26th time. Can ya imagine no Dr Suess stories? My daughter is 26 years old and she still loves Dr. Seuss, her favorite "Oh The Places You Will Go"..HAPPY BIRTHDAY DR. SEUSS!!! One of our children has always been proud to share a birthday with Dr Seuss. He was a modern Shakespeare for children, with his rhythmic stories. The household favorite was "The Sleep Book". I read it so many times for each child that I have most of it memorized! My child turns 18 today... With a love of reading that will last a lifetime. Thanks to Theodore, we have books that children really want to read... again & again. we're the best, cuz we have star on our tummy! the Lorax is an old curmudgeon!